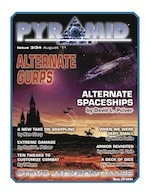 Many Pyramid issues focused on a roughly "modern" theme – which includes today, the not-too-distant future, and the not-yet-forgotten past. (In GURPS terms, this is anything from TL5 to early TL8.) This is where any modern or near-modern genre material would be set, including supers, cliffhangers, and horror-based espionage. It also covers topics suitable for many types of gaming – genres such as martial arts, resources like cinematic locations, and settings such as Infinite Worlds. We're practicing our thievery skills by taking this . . . subject seriously! This month's issue is devoted to rogues, crooks, and those who hope to stop them. Our kleptomaniacal compendium includes "May the Shadows Guide You," which adds to the possibilities presented in GURPS Powers: Divine Favor. Discover a god who grants miracles to rogues and those who promote liberty in all its forms. Fight or flight: the choice is yours! 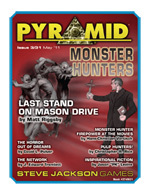 This month's issue is devoted to monsters . . . as well as those who fight them. 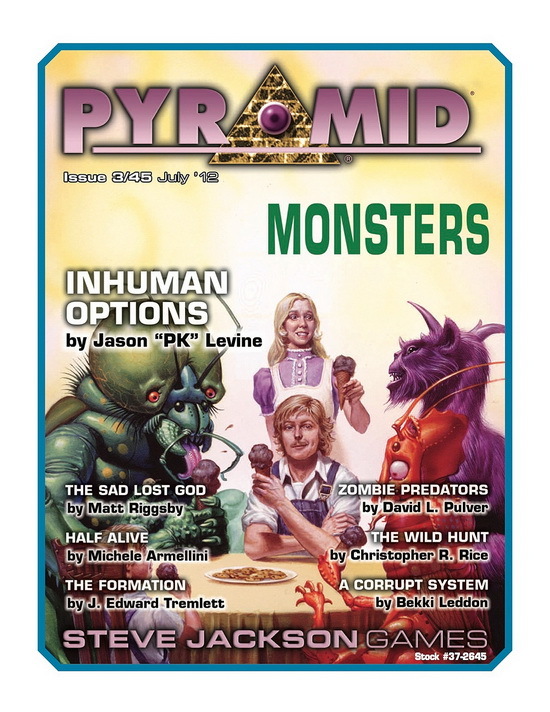 Our creature features include "Inhuman Options," an expansion for GURPS Monster Hunters that adds templates and possibilities for inhuman heroes. Written by that series' architect, Jason "PK" Levine, these four templates are well-suited for any campaign that would welcome PC ghosts, changelings, and more. Rules Made To Be Broken! GURPS is designed to be the game system you want it to be, with a plethora of possibilities and options of all types. But sometimes, you want to push the system to strange new places. Sometimes you want to be radical or experimental. This issue is for you. 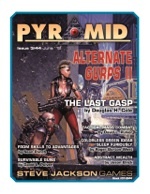 This month's theme is Alternate GURPS II – a sequel to the wildly popular earlier installment. This month's highly optional boundary-breaking brilliance includes "The Last Gasp," an extensive overhaul of the core Fatigue Point system. Hit your wall more gracefully with systems for long-term fatigue . . . and use the new Action Point system to influence your moment-to-moment actions! The shadows from the streaks of rain form lines like prison bars across the wall of your office. Who can you trust in this questionable world? Only yourself . . . and us, of course. 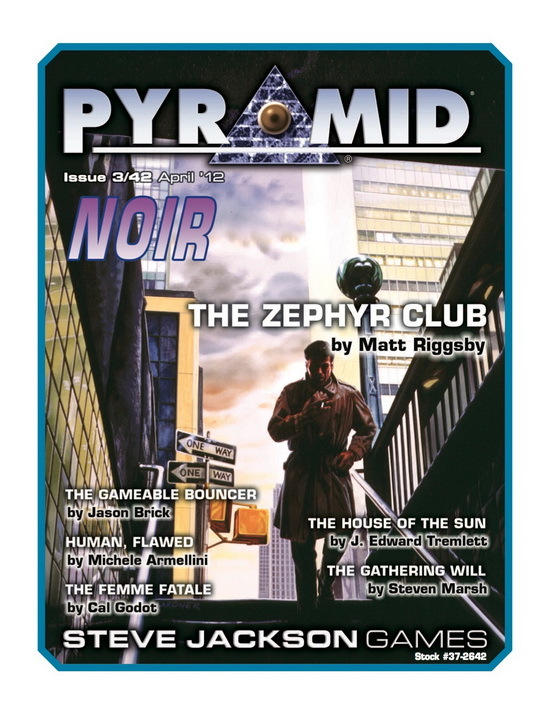 This month we turn our black-and-white gaze on the world of noir with "The Zephyr Club," an adventurous locale for any mostly modern milieu. Written by Matt Riggsby (author of GURPS Locations: Tower of Octavius and others), this place includes magnificent maps plus key GURPS details for its staff. The Zephyr Club is a great place to begin a memorable adventure . . . or end it! Anchors aweigh away and full throttle! This month's volume takes a look at all things related to vehicles. The realistic and impossible from past, present, and future are pulling into your driveway now. 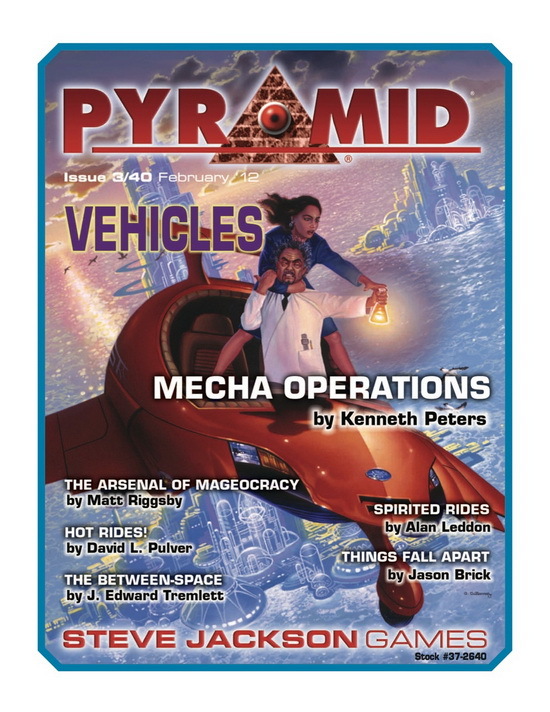 This issue includes "Mecha Operations," which expands and tweaks the GURPS Spaceships rules to better facilitate robotic romps. 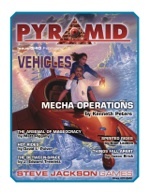 Written by GURPS Ultra-Tech co-author Kenneth Peters, this article includes Spaceships stats for three brilliant bots. It was a time when the genius of gears and the power of perseverance seemed enough to shape the world. 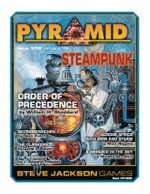 This month's missive revisits this exciting era, bringing to life the power of "Steampunk." This impossibly imaginative issue includes "Order of Precedence," a look at social hierarchies and their implications in Victorian England. 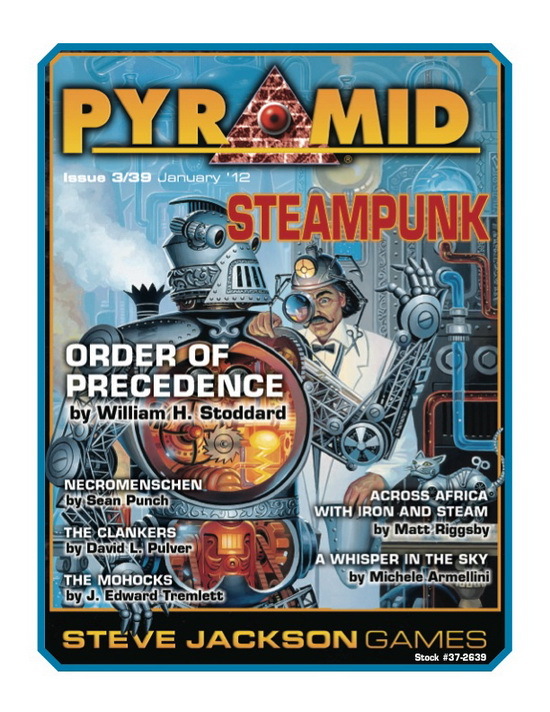 Written by GURPS Steampunk and GURPS Social Engineering author William H. Stoddard, this feature uses the guidelines of Social Engineering to bring interpersonal intrigue to your steampunk world. When it comes to helping craft exactly the kind of game you want, GURPS has choices galore. This month's magazine is dedicated to optional tweaks and techniques that shake up the system, adding new possibilities or challenging the underlying assumptions of the game. 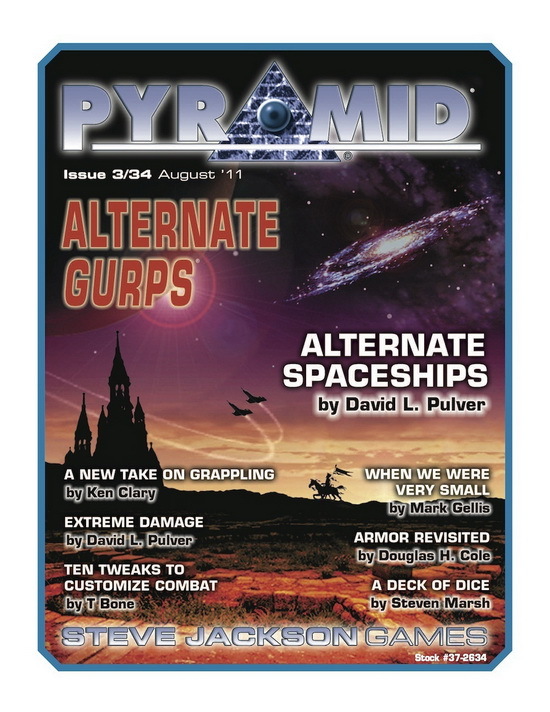 This issue's molecular manipulations include "Alternate Spaceships," a look at modifications to the wildly popular GURPS Spaceships system. 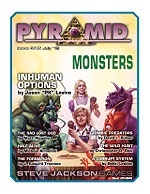 Written by that series' mastermind, David Pulver, this feature includes interesting tweaks, new systems, variant design features, and more. Monster Killers Versus Killer Monsters! If you're all out of bubblegum, maybe it's time to kick some monster's aspirations. This month's issue is dedicated to the denizens of darkness and those who defeat them . . . especially the champions of GURPS Monster Hunters! 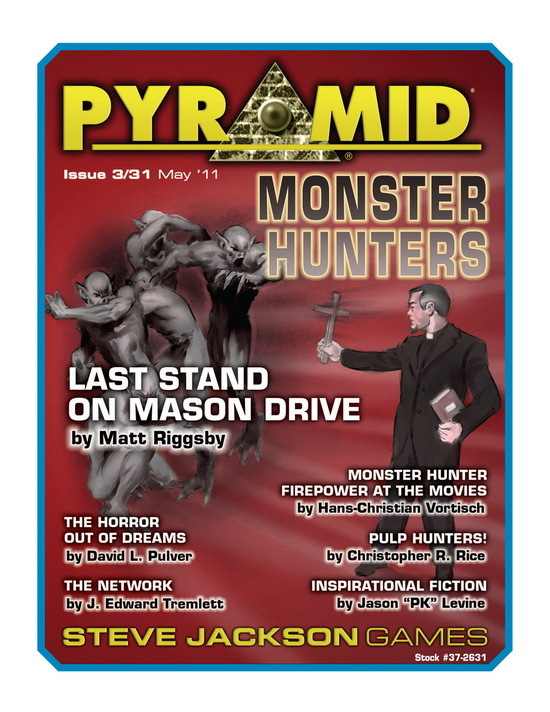 This issue's creature features include "Last Stand on Mason Drive," an adventure for Monster Hunters that pits the heroes versus bad guys and good guys! Written by Matt Riggsby (author of GURPS Dungeon Fantasy 8: Treasure Tables and others), this tale includes stunning maps of the innocent-seeming site and the lair hidden underneath. We've put on our thinking caps and mined our minds for this month's missive . 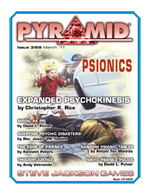 . . and the results are crammed with cranial articles on "Psionics." 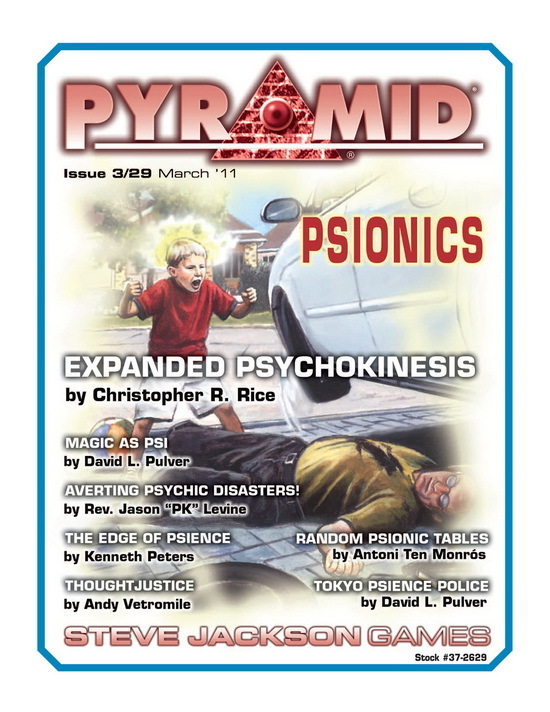 This issue's great thoughts include "Expanded Psychokinesis," a collection of six new abilities that expand on those in GURPS Psionic Powers. Manipulate sound, survive deadly falls, and more! This article also includes new techniques and perks as support. The ocean is known for its countless riches, waiting to be discovered by adventurous souls. 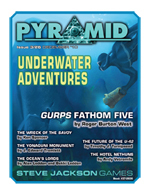 And the key that unlocks the sea's secrets is the "Underwater Adventures" issue. 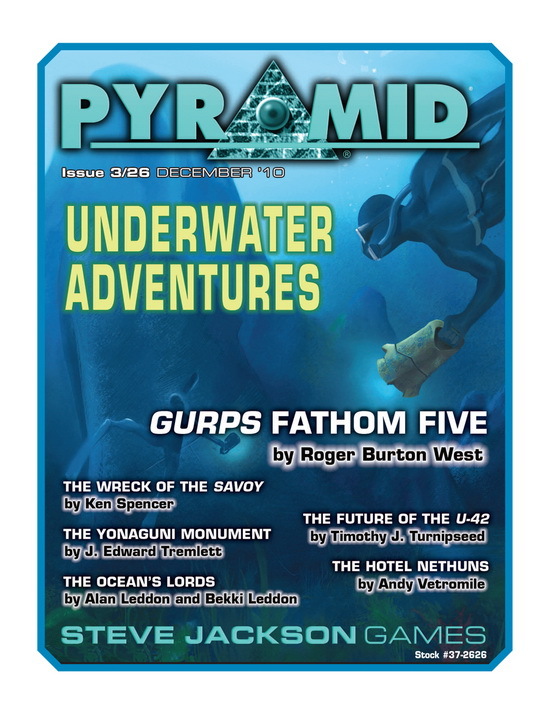 This salt-sprayed supplement contains "GURPS Fathom Five," a collection of new and updated rules for maneuvering and fighting underwater. How low can you dive? How far can you shoot? The answers are herein. 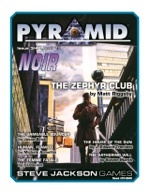 What kind of articles were in issues of Pyramid with modern-era themes? Try these sample articles and see! 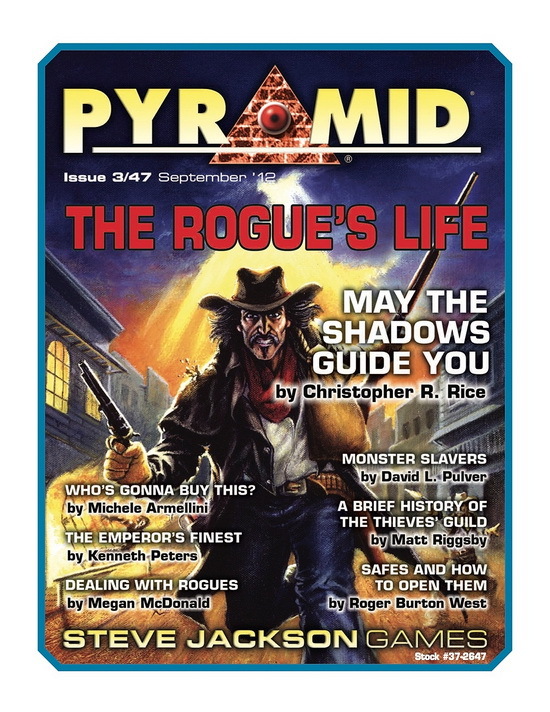 "The Bricks of Marû Dù" from Pyramid #3/05: Horror & Spies. "The Temple of Sobek, the Crocodile God" from Pyramid #3/11: Cinematic Locations.